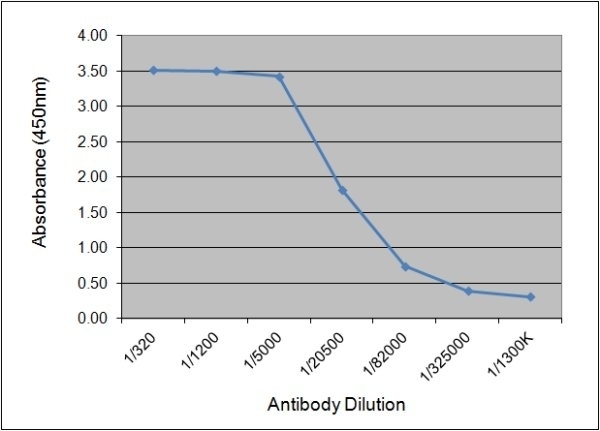 Antigen down ELISA detection of native human C-reactive protein (1707-2004) coated onto microtiter wells detected with Mouse anti Human C-Reactive Protein (MCA5880G) followed by Rabbit F(ab')2 anti Mouse IgG:HRP (STAR13B). ELISA analysis of C-reactive protein using Mouse anti C-reactive protein (MCA5880) as a capture reagent and biotinylated Mouse anti C-reactive protein (MCA5882G) as a detection reagent with native human C-reactive protein (PHP277) as antigen. Detection is by HRP conjugated Streptavidin and substrate. Microtitre plate is read at O.D. 450 nm on the Bio-Rad iMark Microplate Absorbance Reader (Bio-Rad Catalog 168-1135). Serum sample is displayed at 125- (Green), 250- (Red) , and 500- (Blue) fold dilutions. ELISA analysis of C-reactive protein using Mouse anti C-reactive protein (MCA5880) as a capture reagent and biotinylated Mouse anti C-reactive protein (MCA5882G) as a detection reagent with purified human C-reactive protein (Bo-rad cat #: 33751300) as antigen. Detection is by HRP conjugated Streptavidin and substrate. Microtitre plate is read at O.D. 450 nm on the Bio-Rad iMark Microplate Absorbance Reader (Bio-Rad Catalog 168-1135). Serum sample is displayed at 250- (green) and plasma at 250- (orange) fold dilutions. Mouse anti human CRP, clone 160.10G10, recognizes human C-reactive protein, a calcium-binding acute phase reactant belonging to the pentraxin family which is secreted into the plasma by the liver in response to cytokine stimulation.